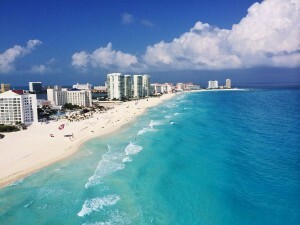 Cancun is one of the main tourist magnets of Yucatan. It has resorts, trendy bars and restaurants in all luxuries and price classes and it targets all type of audiences: from family holidays to spring break party crowds. There is a never ending hotel strip and many facilities have their private beaches. It has great, white beaches and crystal clear water that averages between 26 and 29°C. The best diving can be found at Isla Mujeres, a short ferry ride away. During the season, Cancun is also a great springboard to visit Isla Holbox to dive with Whale Sharks. Cancun has some nice dive spots, such as the world famous Museo Subacuático de Arte (MUSA), an artificial reef of statues. Because the sea near Cancun is very calm, it is a good location for learning to scuba dive and for snorkeling. High season starts early December (until March), which is winter. The highest temperatures are during Summer (June-August), which also happens to be the rainy season (June to September). Basically, it starts with some rain in April, building up until October.